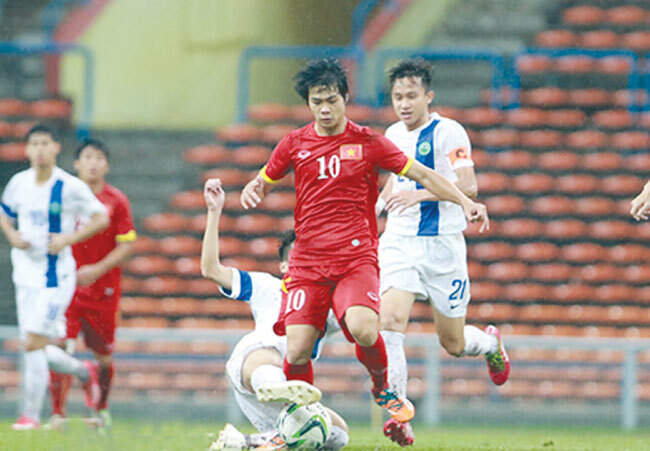 HA NOI (VNS) — Viet Nam are heading to Qatar for the AFC U23 Championship finals after crushing Macau 7-0 yesterday in their last Group I match at the Shah Alam Stadium in Sepang, Malaysia. They finished second in the group with six points behind Japan, who defeated Malaysia 1-0 in the later game. Viet Nam raced to a 6-0 lead in the first half, but were only able to add one more goal after the break. Rising stars Nguyen Cong Phuong and Thanh Binh scored a hat-trick each after Ho Ngoc Thang's opener. Viet Nam went into the game knowing they had to win, and wasted no time in kicking off their 3-4-3 formation. It took only three minutes to open the scoring when Thang broke away from three Macau defenders to beat goalie Ho Man Fai. Macau were considered underdogs from the start of the tournament, but instead of focusing on training, their players tried to relax and went shopping a day ahead of the match. As a result, they allowed Viet Nam to score enough goals to secure their second place position. Just two minutes after the opener, Phuong sent a ball to Binh who sprinted into the box and scored his first goal for the team, despite Ho's efforts to keep it out. Shortly after in the sixth minute, heavy rain forced the players off the field for 90 minutes, but Viet Nam picked up where they left off to make it 3-0 with Phuong converting a mistake by Macau defender Chan Man to score his second goal in Malaysia. And the goals, and the rain, kept on coming. Thang unselfishly forwarded his chance to Binh to bag his second goal from close-range, and Binh was there again to convert a volley to make it five. Viet Nam were awarded a penalty in added time, and Phuong's made no mistake from the spot. The second half was a battle for Macau, as they fought off wave after wave of attacks. Only luck and Ho's efforts kept the score below double figures, and the brave keeper and the crossbar denied Viet Nam at least 10 times in the last 10 minutes. However Phuong, who was appreciated by Macau coach Tam Lao San, was not finished. Receiving a ball from free-kick expert Pham Manh Hung, Phuong produced a perfect curler to beat Ho for the last time. Australia, South Korea, Syria, North Korea, and China have already qualified as top of their groups. The 10 group winners and five best second-placed teams from all groups will join hosts Qatar at the AFC U23 Championship 2016, with January's 16-team competition also serving as Asia's qualifying tournament for the Olympic Games in Rio de Janeiro. The final group winners and the complete line up of the best second-place teams will only be announced after the conclusion of Group B qualifiers, which feature Jordan, Kuwait, Kyrgyzstan and Turkmenistan as well as hosts Pakistan. Group B was scheduled to take place at Lahore's Punjab Stadium from March 23 to 31, but has been postponed due to security concerns following the recent troubles in the Youhanabad area of the city.